Zach Brooks:All you can eat Chinese buffet::Sarah Zilinski:Indian food. But…apparently the Flatiron Lunch readers are not as into Indian food as I am. And their complaints have been heard. I promise to try to cut back on the frequency of posts about Indian food, BUT I want to make sure you all know that I already hold back on how often I write about Indian food. It is a struggle. And Curry Hill makes it soooo easy. If we had three blocks of good Mexican restaurants in the neighborhood, you can be sure I would post about Mexican food all the time. But to keep the FL’ers happy – Italian Food! 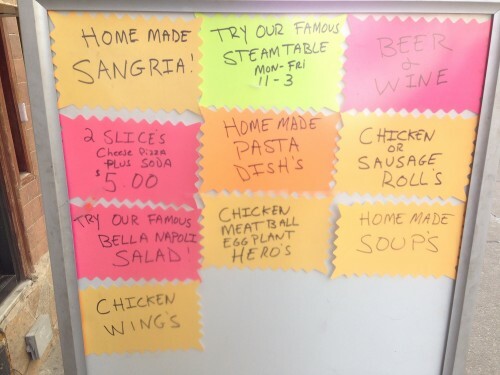 Bella Napoli’s neon paper signage encouraging me to “Try Our Famous Steam Table Mon – Fri 11-3” worked and brought me in. 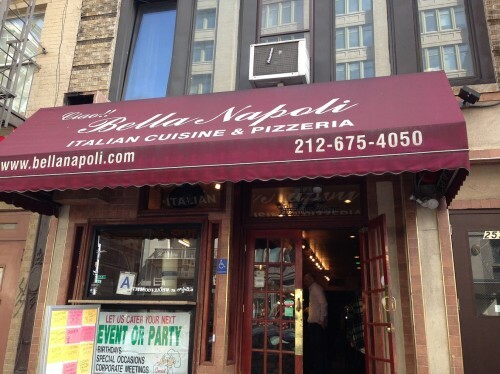 Bella Napoli has already made appearances on ML due to their grandma slice, pizza, and $5 anniversary lunch special at their location on 49th Street btwn 6th and 7th Aves. The steam table I was drawn in for is the new version of the $5 lunch special. Unfortunately, the special has been updated with a higher price of $7.75 for entrée with pasta or salad. 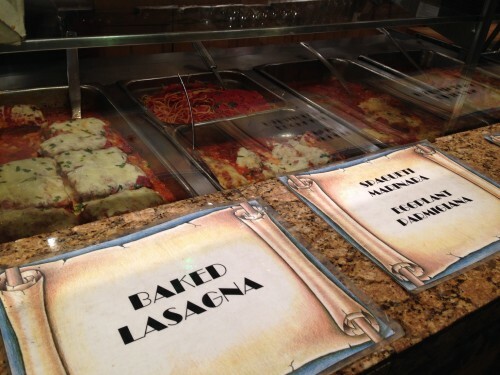 Bella Napoli offers the same hot food options everyday including baked ziti, chicken parm, lasagna, spaghetti and meatballs. They also have a rotation of three different entrees from day to day. For my lunch special, I ordered the chicken mascoponi (breaded and fried chicken with spinach and cream sauce) which included a moderate sized chicken piece and the rest of the container was filled with the coordinating pasta mascoponi. 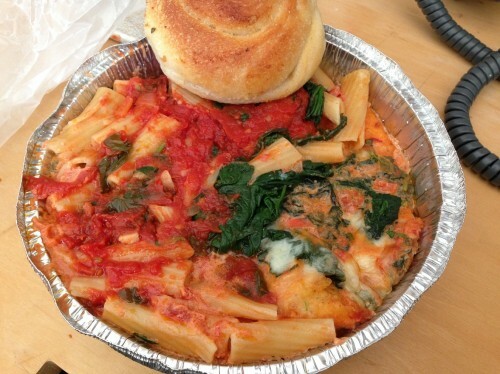 The sauce was great, and my only complaint about the dish was the softness if the pasta – if fell apart as I ate it. 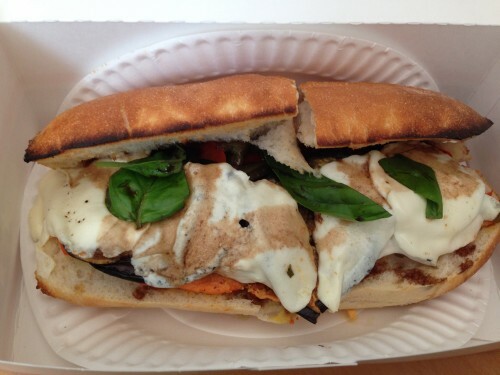 I was also drawn to the Rustico Hero ($6.75) with grilled chicken, grilled eggplant, roasted peppers, melted mozzarella, balsamic vinegar and basil. I agree with Lunch’er Lawrence that this an amazing sandwich. I wasn’t sure how much I would like the roasted eggplant, but it was perfect together. 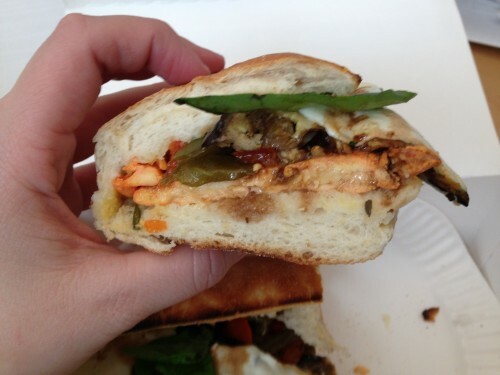 Bells Napoli seems to have gotten the small details right to elevate this sandwich, including toasted bun, melted mozzarella, the grilled chicken seems to have been marinated for extra flavor. And the pizza is great! Overcooked, soft pasta is a bummer. Too bad they don’t have more variety with lunch specials. It is just standard Italian pizza food. Posted by Sarah Zilinski at 11:00 am, March 14th, 2014 under Flatiron Lunch. Do they have Indian pizza? Pfft. Chinese pizza is where it’s at. The apostrophe abuse on that sign hurts my eyes. Haha! I didn’t even notice that. *clap* *clap* *clap* An ACTUAL midtown lunch! I will be stopping by to check this out. Missing the local budget pasta fix since Maffei’s closed shop. …except that it’s in Flatiron, I suppose. Midtown staffers, take note! Bring back REAL Midtown Lunches!! DOWN with pretentious overpriced tiny trendy ‘just over the limit’ lunches!!!!! !